This pendant is an original design – in fact, it has taken me months to make it just the way I imagine it and this is my very first one. 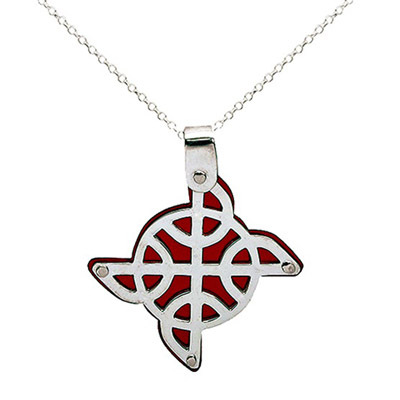 It is a contemporary interpretation of a traditional Celtic Knot. It is made up of a layer of sterling silver, a layer of red translucent acrylic (so that the light can shine through) and another layer of sterling silver – all riveted together (4 rivets in total) with my little cute riveting hammer. The Celtic Knot hangs asymmetrically to add to the contemporary design. The pendant measures approx 25mm across and 30mm in length including the bail. The pendant comes complete with an 18inch sterling silver chain. Other lengths available on request. I am intrigued by mixed media and the interplay of light through acrylic. Really hope you like it too! All items are put into a jewellery box, so that the item is ready to present to your loved one as a gift. Thanks for dropping by my shop!